← WHY IS JUVENILE LIFER CHARLES LEWIS STILL IN PRISON, 16 YRS. AFTER HIS CASE WAS DISMISSED? HEARING ON DISABLED, ABUSED CHILD MAY 2; WHY DOES JUDGE MARTHA SNOW ENDANGER JANNA, JAIL MOM? As I write what is found below, I am reminded of the interview I had several weeks ago in the living room of Jann DeBacker’s daughter, Shannon DeBacker. It was a shared investigation with me working in the capacity and purpose of my not-for-profit entity of “We the People for the People,” and David Schied, a fully-credentialed Michigan schoolteacher, an investigative journalist and co-founder with me of RICO Busters. In her living room, Shannon DeBacker presented us with compelling testimony and a plethora of evidence, some so graphically sickening that we thought it better to protect the privacy of her disabled child, about whom this story concerns. It is with that past personal knowledge and first-hand access to the evidence of the reported prolonged sexual abuse of this disabled child that I provide an update of this situation by publishing the results of my latest interview this past Friday with Shannon DeBacker’s mother, Jannice DeBacker. I thus write this story with feverish urgency and the need to rally the American public in defense of this defenseless and precious human being, by expounding upon the outcries of this child’s mother and grandmother. 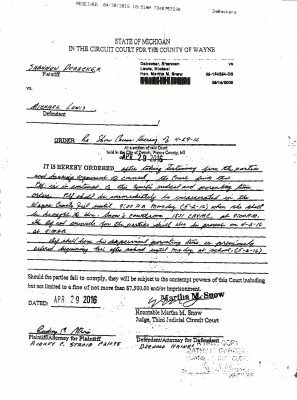 Just this past Friday, April 29, 2016, Wayne County’s Third Circuit Court held a “Show Cause” hearing in the case of “Shannon Debacker vs Michael Lewis,” Case No. 09-154554-DS. Jann DeBacker, the mother of Shannon DeBacker, was the only person attending that hearing to support her daughter. She watched with horror in the courtroom as her daughter Shannon was falsely charged with “contempt of court” by Judge Martha Snow. Her daughter was then handcuffed, escorted out of the court, locked up, and falsely imprisoned for the first time in her life….all because Shannon had declined the judge’s appointment of an attorney; and because Shannon had insisted instead on presenting herself to the court as a natural and sane person! She said her daughter has been forced to endure a long history of past attorneys which she claims have sold her out and cut deals with this and other various judges off the record and inside of the judges’ chambers. Thus, Shannon DeBacker no longer trusts attorneys. “I honestly believe that most attorneys – at least most operating here in Michigan courts – have ‘sold their souls to the devil,’” she added. Before being sentenced to jail by this so-called “judge” Snow, Jann’s daughter Shannon had tried reasoning with the court. She had stated numerous times before that she has been double-crossed repeatedly already by attorneys, and that she doesn’t trust any attorney with this particular case because it is so serious. 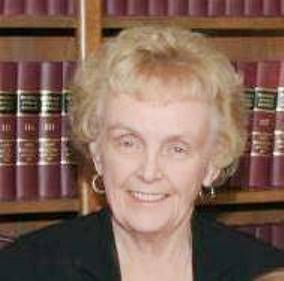 Jann DeBacker is the grandmother of Janna Lewis. She says she supports her daughter Shannon DeBacker because she knows firsthand that this court case is really about the settlement of an accompanying case. 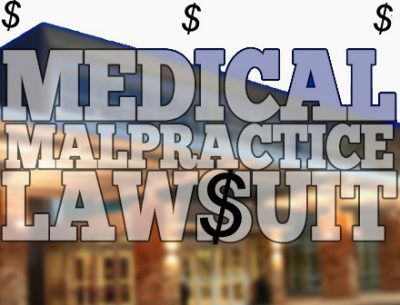 That is a multi-million dollar medical malpractice lawsuit against the medical community for her granddaughter being born clinically dead and only being revived to the point of having to live with worst type of Cerebral Palsy for the rest of her life. “These never-ending court cases have been ruining all of our lives – that of my daughter and granddaughter and me – for the past five years,” she stated. 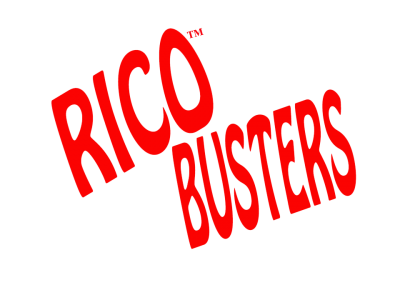 Essentially, the actual reason why so many Charter County of Wayne “government usurpers,” as RICO-Busters calls them, are against Shannon DeBacker today is because her daughter, Janna Lewis, has this huge civil action pending. It all started weeks prior to Janna’s birthdate of July 15, 2009 when Shannon had gone to Oakwood Hospital Emergency room in full term pregnancy. While she was there, the doctors and medical staff induced labor but Shannon was ultimately sent home before delivery. At home, a rupture occurred and as a result, Baby Janna was deprived of oxygen. She was next subject to a botched surgical procedure and born with cerebral palsy. For the past few years since Janna’s birth, the court and other “government actors” have been incrementally and systematically taking custody away from Shannon DeBacker under false pretenses. They have been constructing a fraudulent paper trail of lies and covering up the alleged criminal activity of the baby’s father, Michael Lewis, so as to bring the case to a final conclusion that neither parent is fit to manage the life and the lucrative malpractice settlement money. In essence, these attorneys, as “officers of the courts,” the judges, referees, social workers, guardian ad litems, conservators, and investigators hired by or appointed by the probate court, have long been stealing the proceeds of this massive lawsuit, something that happens much more frequently than anyone wants to admit in large settlement civil cases such as this one. The facts behind all this prove that this “court” is nothing more or less than the alter-ego of this “judge” Martha Snow. It isn’t about the physical health, welfare or safety of Jann DeBacker’s disabled granddaughter, Janna Lewis. It is all about who controls the money that is being legally designated to the judge’s cronies for covering Mrs. DeBacker’s granddaughter’s future health, welfare and safety. 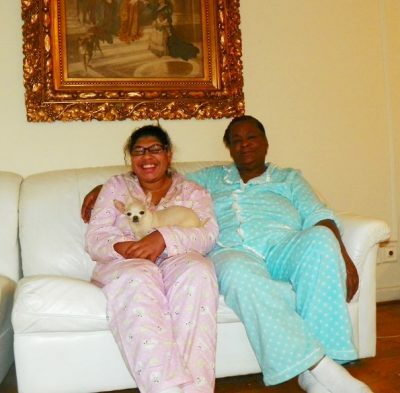 Mailauni and Lennette Williams relax at home after she was returned to her mother subsequent to a 6-month kidnapping. Mailauni also suffers from cerebral palsy, and was expected to live no more than a few months. With her mother’s nurturing, she has graduated from high school and is now 32 years old. Thus, Martha Snow presents much more than a simple “appearance of impropriety” defining “judicial misconduct;” she is clearly operating this court with unclean hands, using it and using Shannon’s daughter and Jann’s granddaughter as a “payback” tool for lining the pockets of her cronies. “She needs to be held liable for covering up the criminal activity of my disabled daughter’s sexual perpetrator; and for ordering my grandbaby’s perverted father to instead have temporary custody over my granddaughter while criminally ordering my daughter Shannon to a weekend of false imprisonment,” cried Jann DeBacker during the interview. Judge Martha Snow showed favoritism to the father Michael Lewis in court on Friday simply because he has an attorney, Audrey C. Stroia (P-21098) and Shannon DeBacker has no attorney! The underlying fact is that this “judge” Martha Snow did like other Wayne County judges Arthur Lombard and Christopher Dingell did on this case for previously years, not investigating the father’s past history and continuing to conspire in covering up Shannon DeBacker’s old and new evidence and allegations of specific sexual abuse, the Debackers say. In previous years, Arthur Lombard and Christopher Dingell continued to order shared custody between mother and father despite all the facts and evidence being brought to their attention by Shannon DeBacker and her mother. Grandma Jann DeBacker said Lewis’ activity – and its cover-up – has been ongoing since 2011, and is supported by credible evidence and an abundance of pictures and incriminating videos. “My granddaughter been crying out for help; and my daughter is now jailed for trying to bring attention to these sexual abuses by Michael Lewis,” Mrs. DeBacker exclaimed. Jann stated that both she and Shannon have been praying for help, been pleading for help, both have been ignored by law enforcement and child protective agencies, been ignored by many of the state insurance mandated doctors and medical facilities, been ignored by judges and even ignored by the mainstream media. “I and my daughter contacted the State Agencies Child Protective Services and Monroe Police Department in 2015 and our complaints were ignored. We also contacted the Southgate and Taylor police departments,” she added. “I contacted Detective Cole today at court when my daughter was being arrested because he had an appointment for Janna scheduled with ‘Kids Talk’ on May 5, 2016; but we needed help today! I now feel that my granddaughter and daughter are both in imminent danger. I called Detective Grodin last year and he corroborated our allegations to a C.P.S worker who knew about these crimes yet denied an investigation of these allegations. But we needed help today! I now feel that my granddaughter and daughter are both in imminent danger. I called Detective Grodin last year and he corroborated our allegations to a C.P.S worker who knew about these crimes yet denied an investigation of these allegations. But the court still has granted custody this weekend to Janna’s father today….even despite the proof of his sexual exploits. 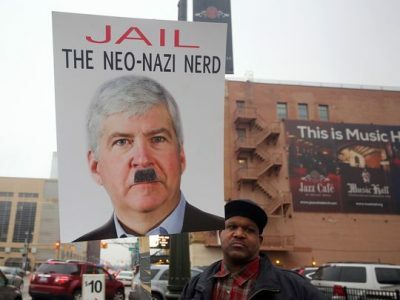 Michigan Gov. 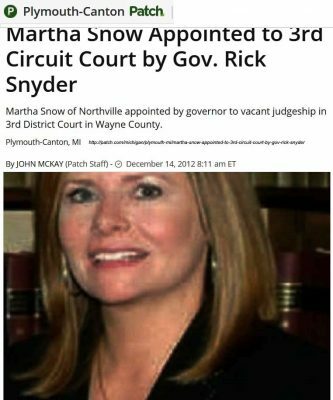 Rick Snyder appointed Martha Snow to the bench. The rallying public needs to ask what more evidence there is to draw the links in the “chain” of association between the criminal conduct of Michael Lewis, accused of cowardly acting in the darkness and privacy of his home, and the criminal conduct of Martha Snow, accused of usurping judicial power and authority in open court. Michael Lewis’ “schizophrenia” is being treated by Dr. Thomas Pinson. 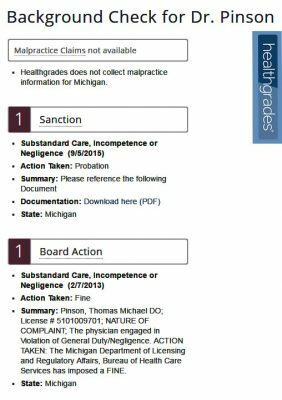 “Dr.” Pinson is currently on “probation” by the Medical Board for “incompetence,” “negligence,” and other forms of substandard care. 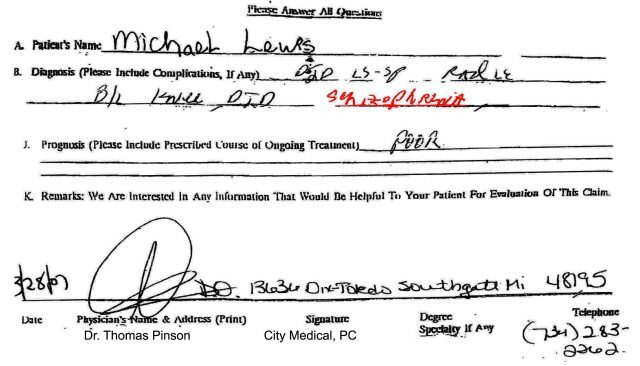 Moreover, Lewis’ doctor, Thomas Pinson, is believed to be the very same person who in 1988 was criminally charged with sixteen (16) counts of receiving stolen property and providing a pole barn for an auto “chop-shop” operation/ As shown above on the document bearing Pinson’s signature below Lewis’ diagnosis, he either does or did operate his medical “practice” at 13636 Dix Toledo Rd. in Southgate, Michigan 48195. Note that according to Dun & Bradstreet, that place of business, “City Medical, PC,” is showing a lucrative $1,200,000.00 annual income. 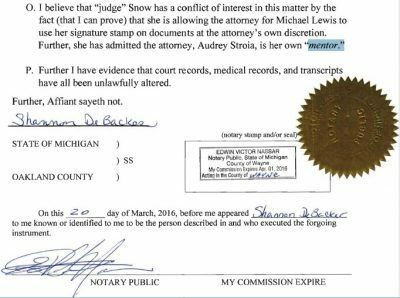 Interestingly however, it appears that office is shared with someone carrying the very same last name as Michael Lewis’ attorney and Judge Martha Snow’s “mentor.” She is a chiropractor by the name of Susan Stroia. Even more interesting is the fact that Stroia and Pinson appear to be more than business partners in City Medical, PC; they appear to be husband and wife. So besides the obvious fanfare of friendship, cronyism and nepotism between “judicial usurper” Martha Snow, her mentor Audrey Stroia, and Stroia’s mega-successful daughter and son-in-law, and Stroia’s client, Michael Lewis, why else might Snow be catering favorably and providing “preferential treatment” to attorney Audrey Stroia? Wouldn’t it be because she is an ESTATE PLANNING expert? 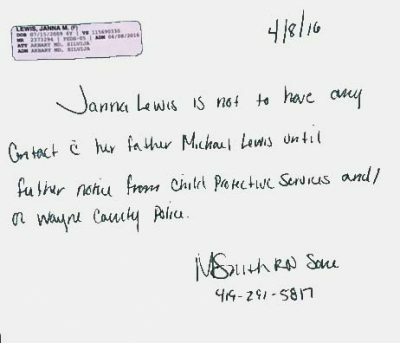 In sum, the corporate and state “players” operating the Wayne County Circuit Court are keenly aware of Janna Lewis’ disability and the fact that a multi-million dollar civil case was filed and is soon scheduled to reach a final court settlement after more than five years of state takeover and criminal cover-up! For the past few years since Janna’s birth, the court and other “government actors” have been incrementally and systematically taking custody away from Shannon DeBacker under false pretenses. They have been constructing a fraudulent paper trail of lies and covering up criminal activity of the baby’s father, Michael Lewis, so to bring the case to a final conclusion that neither parent is fit to manage the life and the lucrative malpractice settlement money. In essence, these attorneys, as “officers of the courts,” the judges, referees, social workers, guardian ad litems, conservators, and investigators hired by or appointed by the probate court, have long been already stealing the proceeds of this massive lawsuit, something that happens much more frequently than anyone wants to admit in large settlement civil cases such as this one. Atty. Audrey Stroia of Stroia & Associates specializing in estate planning/Facebook photo. So besides the obvious fanfare of friendship, cronyism and nepotism between “judicial usurper” Martha Snow, her mentor Audrey Stroia, and Stroia’s mega-successful daughter and “incompetent” son-in-law, and Stroia’s client, Michael Lewis, why else might Snow be catering favorably and providing “preferential treatment” to attorney Audrey Stroia? Wouldn’t it be because she is an ESTATE PLANNING expert? 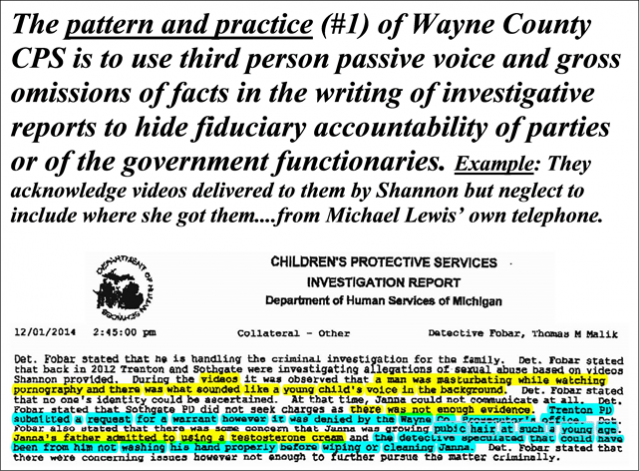 In sum, the corporate and state “players” operating the Wayne County Circuit Court are keenly aware of Janna Lewis’ disability and the fact that a multi-million dollar civil case was filed and is soon scheduled to reach a final court settlement after more than five years of state takeover and criminal cover-up! In court last Friday, April 29, Shannon took a bold stand against the corruption and greed that has inundated her daughter’s medical malpractice case. She chose to stand on her own rather than to allow an evidently crooked judge and attorneys to keep this barreling train on the same railroad track that it has been on for the past few years. She took a stand as a mother who truly loves her daughter. 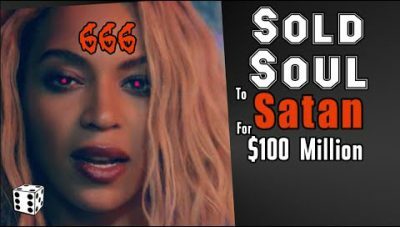 She also took a stand as a natural person deciding to handle her own affairs without an attorney, rather than to continue trusting more despicable members of the Michigan State BAR. She had that right according to federal law (i.e., see 28 U.S.C §1654), and the “judge” Martha Snow was in violation of Shannon DeBacker’s constitutionally guaranteed rights when that judge sent Shannon to jail with the trumped up “contempt of court” charge. Shannon additionally has every right to refuse to comply with an unlawful “order” of the court when that order disregards the safety and welfare of her child; particularly when she had a recent order by a registered nurse asserting that she nor anyone else should be allowing Michael Lewis to have access to Janna because she would be in imminent physical danger! Judge Martha Snow refused to address the new sexual assault allegations and evidence to support the reasoning of that nurse. Mrs. DeBacker insists that the pictures in evidence against Michael Lewis are much too graphic to place them in this online news story. THE DEBACKERS ARE ASKING THAT SUPPORTERS COME TO THEIRHEARING MONDAY, MAY 2 AT 9AM, IN THE COURTROOM OF JUDGE MARTHA SNOW, RM. 1812, AT 2 WOODWARD AVE.
21 Responses to HEARING ON DISABLED, ABUSED CHILD MAY 2; WHY DOES JUDGE MARTHA SNOW ENDANGER JANNA, JAIL MOM? Also check the case of Judge Deborah Ross Adams of Wayne County. The JTC issued a token 180-day suspension, but in 2013, the Michigan Supreme Court ordered her removed from the bench. Also check out Judge Ross Adams, also of Wayne County. Do you see where I am going with this? 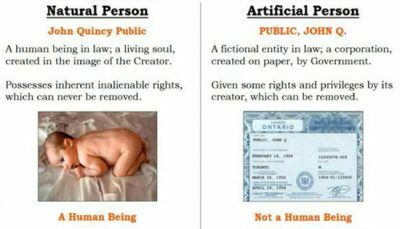 Learn how the system works and fight for your rights. Document everything. The downside to Black Robe Syndrome is the sense the judge has of being totally invulnerable from discipline; what you need will be in the record. ACLU denied to look further into my case but agrees this shouldn’t be happening. Janna is being exposed to extremely high levels of testosterone that causes tumors and other detrimental health affects and even her drs have filed 3200s yet the judge and the state still ignore that my child is in danger and allow her to remain in harm’s way. Snow was appointed not elected. The judge was initially appointed, but retains her position by elections; as stated previously, you need to check when the re-election is scheduled. You can get low-cost/free help from Legal Services of South Central Michigan in Ann Arbor: 734-665-6181. Pertaining to gag order, try: Liberty Counsel. Check the court records, this judge may be up for re-election in January 2017. You can protest with signs, and explain that you cannot explain why because of the judge’s gag order having been imposed before the election. Turn the gag order to your benefit. If you go public, you may find other people to support you and expand your group; it is the safety of your children that motivates you, you will find support in the court of public opinion. Organize and mobilize. I have been researching the public record for indications of “family values” of this judge. It appears that when she was running for election, her step son was caught destroying the signs of her opponents; even though that is a misdemeanour offence of, at least, malicious destruction of property, I can find no record that the matter was ever prosecuted or in the record other than the local media reports. You can expect that the legal system within Wayne County will act to protect its members as its first consideration. If there is persistent conduct of the type that you have described, I would try to form a plaintiff’s group and get the matter before the Michigan Supreme Court. The judge is relying on you not having the resources to take this higher up the judicial ladder, where you are more likely to find justice. You can fight an unconstitutional gag order. I would contact the ACLU immediately. The fact that the JTC did nothing is not surprising, but they will be watching very closely what happens here; that is progress. You can also file a Complaint for Writ of Superintending Control with a higher court and take it out of this judge’s hands. If you are going to represent yourself, you need to know about the procedures above the judge hearing your case. I would not give up, just get some good advice. You could check out Legal Services of South Central Michigan in Ann Arbor: 734-665-6181 for free or low cost help. The higher up the system you go, the more you are to see justice. Despite how it appears now, the lower-court judge can be over-ruled, you must use the procedures to do that and document everything, and get the hearing transcripts. I have just been researching the aspect of an unconstitutional gag order. This may be the vehicle whereby you can get some worthwhile help to act on your behalf in this case. Alan Dershowitz, the Harvard law professor, and the Liberty Counsel have made dealing with this type of gag order to silence parents something of a crusade. Do a Google search of the case of Justina Pelletier, and try to make contact with the aforenamed person and group. This type of gag order is widely viewed as an intimidation tactic to scare parents into giving up their constitutional rights to free speech. There are people out there who will help you. Thank u for the info as I recently have submitted my case to the ACLU and also filed my appeal. GOD BLESS YOU AND YOURS! Keep going Shannon! My case us similar. I went before her on August 29. She did the same thing to me. Please contact me Shannon via email, april.crews@yahoo.com. Thank you for this. I went to court before Martha Snow on Monday August 29th. She refused to listen to the facts in re to my 7 year old and 5 year old child abuse. My 7 year old told me that she was afraid of a man that my ex husband has dropping off at school. Martha Snow has the “black robe syndrome” and thinks that she is above the law. She allowed my ex husband’s attorney slander and defame my son with no physical evidence except for pictures from social media. Most of the pictures was not even my son. She’s trying to make me pay legal fees even though I told her that I am under a Chapter 13 bankruptcy. Well, they won’t get any money out of me! Bankruptcy trustees not having it. They are Federal. They hate pro-per litigants because the judges and lawyers regard the courts and law as a private club where they can rely on each other to keep the gravy train running. Shannon has very right to defend herself. I would talk to the ACLU to file a law suit against the judge for money damages for wrongful imprisonment and abuse of process. I would also file a complaint against Martha Snow with the Judicial Tenure Commission; she does not look fit to hold the post, and has what most new judges experience as “Black Robe Syndrome” The only thing held in contempt here were Shannon’s rights under the Constitution. I’ve already filed with JTC but they denied my complaint. Judge has now placed a gag order and handed custody to her abuser without a custody motion or due process prior. She has cut off all contact with my daughter and I and she is declining rapidly. Prayers to Shannon and her family to stay strong. 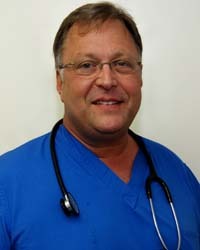 I myself, have been a victim of medical malpractice. I too can attest to the truth and fact that the doctors and Lawyers will do and do do anything within reach and power to discredit the victim. My case or past is not the topic at hand. The issue is ever present and sadly continues to evolve. Even further in scope then my dreams and my past experiences. I definitely, feel for Shannon, her family and this child. I support you and your actions. God bless you! I do believe the truth will continue to become unvieled. Conduct of suits in person or by counsel. This is absolutely ludicrous Shannon and her mother have been dealing with this for far too long. Something needs to be done and clearly Wayne County Circuit Court and/or the judge Martha snow civil duties to protect Jana. I wish I could have made it today because I know that Shannon and her mother have been and are continuously doing everything in their power to make sure Jana is safe.